The S&P 500 finished the week just shy of the 2,600 level that everyone is watching as an important sign that the rally is for real. 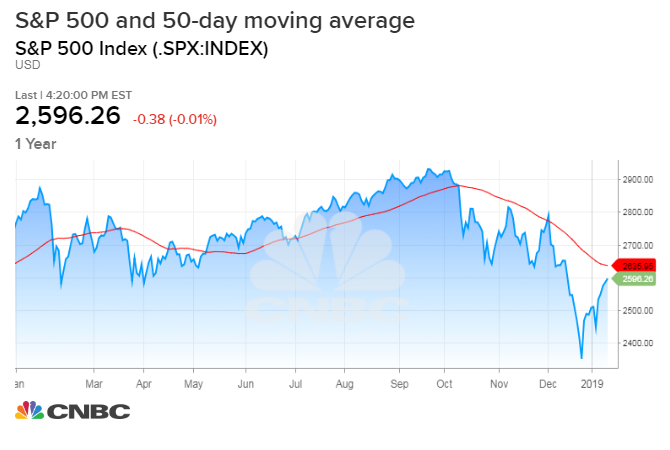 Technical analysts say 2,600 was an important pivot point for the S&P 500 all of last year, and a rally that holds above it could signal a bottom was reached in late December. If the S&P fails, analysts say it could continue to tackle the resistance level but it could also mean the market tests its recent lows. Cappelleri points out that the violent swings of recent weeks subsided as the S&P approached 2,600. He said the S&P went for a fifth day Friday without a one percent move higher or lower fir the first time since October. That's the longest quiet period since the index went 74 days without a one percent move between June 26 and October 9. But 2,600 could also be a red flag. "It could reverse pretty violently, and I think that's what a lot of people expect because we are in proximity of the level everyone's been talking about— 2,600. The most surprising move could be that the last few days developed into a potential bullish flag, and you have another move before there's a decline," he said. The S&P is taking aim at 2,600 after it has quickly regained more than 10 percent from its Dec. 24 closing low. Analysts said the earnings season, which starts in the coming week with major banks, could be an important catalyst for the S&P in either direction. "This is pure chart-based thing. There's not any fundamental magic involved in it," said Julian Emanuel, BTIG chief equity and derivatives strategist. Emanuel described the level as a "wall of resistance." He said it would make sense for the S&P 500 to pull back from this level before attempting to hold above it again. "If you look at the last year in particular, it was where the first leg of the sell off troughed in October," said Emanuel. "It's where the pullbacks bottomed before the summer rally. Very simply, people look at those kind of things in an environment where you're struggling to explain the price action both to the downside and now to the upside." 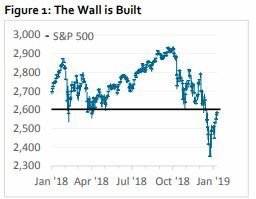 The 2,600 is actually the beginning of a whole band of important levels, according to Robert Sluymer, technical analyst with Fundstrat. The Oct. 29 low was 2,603, and the 50 percent retracement of the decline from the highs in October is 2,643. The 50-day moving average is also at 2,635. "If you've been bearish, this just looks like a bear market rally and people are going to start shorting. This is where the bulls and bears come together, and you're going to start to see this tussle," said Sluymer. Sluymer said he believes the market put in a cycle low. It closed at 2,351 on Christmas Eve . "It's still to be proven. There's lots of damage to the market and the market is going to take time. Ultimately, I think you'll get a pullback," he said. "If you're a short term trader, this is not where you want to put capital to work. If you're bearish, this is where you start putting on shorts."